Last tutorial was about transformations. This tutorial will be a short one. I’m going to talk about adding color to your mesh. I will continue with the source code from tutorial II. The default values are: red = 1, green = 1, blue = 1 and alpha = 1. Those values are white, and that’s why all the squares we previous made has a white color. Notice that with flat coloring you don’t need to tell OpenGL ES to turn it on or off. OpenGL ES uses flat coloring as a default way of coloring the meshes. Smooth coloring is gained when you give each vertex its own color. 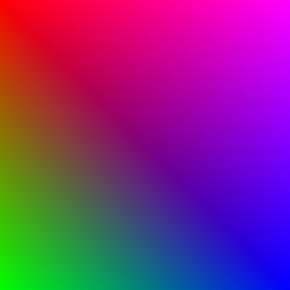 OpenGL ES will interpolate the colors between the vertices and you will gain a smooth coloring effect. Just as with the flat coloring you tell OpenGL ES what to work with and it will be used as long as you don’t say anything else. Don’t forget to add colorBuffer as a variable to the class as well. Don’t forget to disable the use of the color array. If you don’t disable the color array both squares will be smooth colored. Try it. Let’s use this new smooth square as well. Start by adding it to your renderer. We need to move the square down a bit so they don’t collide. Now if you compile and run the application you will see two squares, one solid blue and one smooth with different colors. Thank you for your tutorials; without them I would have not made it so far as a beginner. Really, thanks! I have a question concerning the color buffer and drawing triangle fans. If I am trying to generate a circle with the gradient of the color wheel, is it possible to reassign the color value of the origin point per each next triangle in the fan? The problem is, having set the origin and its color in the beginning, each subsequent triangle will blend along two of its vertices along the gradient, but towards the third vertex (the origin) it’ll always blend the original color value assigned to the origin. Anyways, any help would be much appreciated since can’t seem to google route the answer. Thanks, really happy you like them! I don’t think that it is possible to do it the way you like. I would probably make it with triangles. Excellent articles, Man. Thank you so much!